Katie Derham explores dance on film, from Fred and Ginger's elegance to the lycra of 1980s dance movies, and talks to Mandy Moore, award-winning choreographer of La La Land. Katie Derham explores dance on film, from Fred and Ginger's elegance to the lycra of 1980s dance movies. And coming right up to the present, Katie talks to Mandy Moore, award-winning choreographer of La La Land. They'll discuss the art of choreographing for the big screen, how it differs to the stage. Composer: Arthur Freed. Performer: Gene Kelly. Performer: Donald O Connor. Performer: Doris Day. Orchestra: MGM Studio Orchestra. Singin' in the Rain (Original MGM Soundtrack). Singer: Fred Astaire. Singer: Ginger Rogers. Orchestra: Leo Reisman Orchestra. Conductor: Leo Reisman. Orchestra: MGM Studio Orchestra. Conductor: Johnny Green. Performer: Liza Minnelli. Orchestra: Original Soundtrack Orchestra. Cabaret - Original Soundtrack recording. Orchestra: La La Land Orchestra. Conductor: Tim Davies. 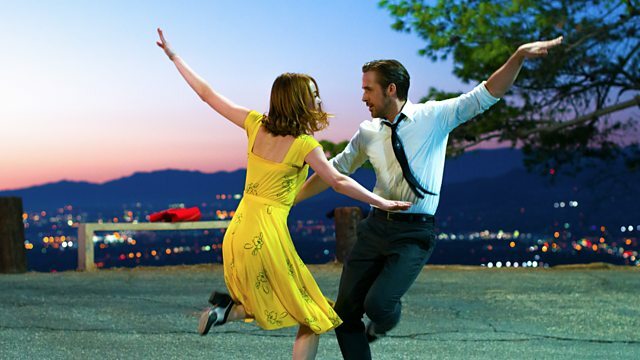 La La Land (Original Motion Picture Soundtrack). Performer: La La Land Cast. Orchestra: La La Land Orchestra. Orchestra: Philharmonia Orchestra. Conductor: Kenneth Alwyn. The Great British Film Music Album. Composer: Franke Previte. Composer: John DeNicola. Singer: Bill Medley. Singer: Jennifer Warnes. Ensemble: Studio-Ensemble.